It was my friend Anne’s birthday this week and I made her these cakes… the recipe is supposed to be a sponge for a sandwich cake but it also works well as fairy cakes. The sponge is really light and fluffy and the icing is creamy. In fact I like this cake a bit too much so I only make these when we have a birthday or if we have people coming to visit and I want to impress. 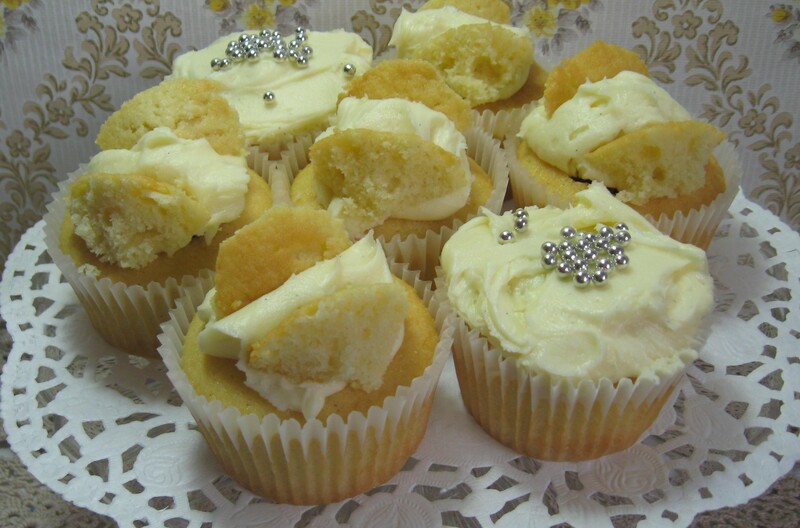 2 buttered and floured 23cm cake tins which are 5 cm deep or 2 x 12 standard muffin tins with papers. I also line the bottom of the sandwich tins with a circle of baking parchment. Preheat your oven to gas 4. Add a tbsp of cider vinegar to the milk. This will make the milk separate and turn lumpy, don’t worry, this is what helps to make the sponge so light. Butter and flour the sandwich cake tins or line the muffin tins with papers. In a separate bowl, cream the butter with the sugar until the mixture becomes pale and slightly lemon coloured. Separate the eggs, and add the yolks to the sugar/butter mix one by one, beating each one in before adding the next yolk. Finally add the vanilla extract. Using a metal spoon, gently fold in the milk and the flour, alternately adding a little of each at a time until just combined. Don’t over mix. In another bowl, whisk the egg whites so they form soft, billowy peaks. Add one third of the egg whites to the cake mixture and fold through well (I use a spatula but a metal spoon works fine as well) add the second third, mix in and finally the last third, mix until just combined. Divide the mixture into the two sandwich tins or into the muffin tins. Bake for 20-25 minutes for the cake and about 15-20 minutes for the muffins, basically until the tops gently spring back when you press them with a finger tip, or until a wooden skewer pushed into the centre of the cakes comes out clean. If you don’t have a super wide oven you will need to swop the trays over just over the half way baking time. 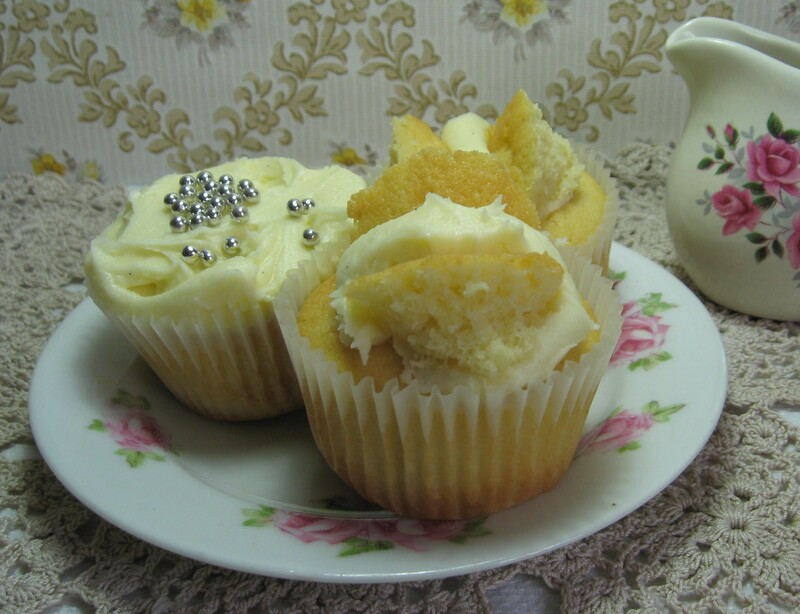 Allow to cool in their tins for a few minutes before transferring to a cake rack before icing. Using a wooden spoon, cream the butter with 50g of sifted icing sugar. Add a pinch of salt. Once the sugar has been incorporated into the butter, add 1 tbsp of double cream and 100g of sifted icing sugar. Continue to cream into the butter. Add the vanilla extract. Continue to mix together. Add another tbsp of cream and 100 g of sifted icing sugar. Mix well. Finally add the last tbsp of the double cream and the last 100g of icing sugar. Add some of the icing between the two layers of the sandwich cake (a little lemon curd or raspberry jam is lovely spread on one bottom of the cake as well, put the top layer on and then cover with the rest of the icing. There should be enough icing to cover the top and the sides. I’m not really sure how long these cakes keep, because of the cream in the icing I wouldn’t suggest they get left out for too long, however we are so greedy here that they only seem to last us about 24 hours.